This is the twenty-third of 87 letters exchanged during World War II between Nicholas Salvatore and Elizabeth Galloway. 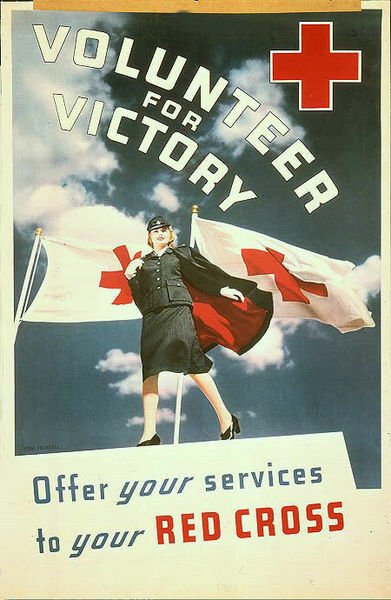 Mother and I started volunteering with the Red Cross. They say when we write letters to soldiers they should be kept “cheery” and free of “ bad or depressing news.” I’m sorry if I’ve complained a lot. Life here isn’t that bad, I know that. It’s nothing like over there. I just get so lonely. That’s always been my biggest trouble. Know that we are thinking of you here, especially when I wrap packages of gauze or do anything else that they need done. It’s not much I know, but everything helps. It’s childish but I’ve started to believe everything I do to help the war effort helps to keep you safe. I even came up with a conversion system where every hour I volunteer guarantees you five minutes of safety. If only it worked that way. I’ve avoided the war as much as I could since it started. Then we went to the pictures the other day and they had a newsreel of the fighting in Europe. I could hear about it on the radio and see pictures in LIFE, but watching footage of what was happening as it unfolded moment by moment, it was too much. I ran out in tears. The next day we went down to the Red Cross. I’ve spent so much time being selfish and it never got me anywhere. I want to do my part. I want to keep you safe. You mustn’t let yourself be hurt, you hear me? I want you back just as you were. Anyways, you can’t get hurt as you’d only end up meeting Catherine Barkley or I guess it would be her daughter at this point (well, you know what I mean), and I won’t lose you now. Then again, if Gary Cooper showed up here, well, what girl could resist? In all seriousness though, keep yourself safe. I care about you very much.